This project is a bidirection amplifier which permit to achieve up to 30Bm of output power from commonly used access points or WiFi cards (PCMCIA, PCI, USB). Also, it amplify the RX signal by 20dB, so now it's easy to extend covered distance! 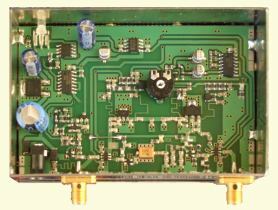 Also, this amplifier can be used to amplify ATV (Audio/Video) signal, both in RX and in TX: you can connect directly to the antenna, to improve RX and TX regarding to the coax cable loss, using the optional mast box. Improving WiFi coverage is simple using RAST2432, in both indoor and outdoor environment, due to its large output power, high sensitivity and out-of-band noise filtering (look at the RX characteristic above)! Due to its high output power, this project can be used by licensed amateur radio operators only. How the amplifier should be supplied? The amplifier must be supplied at 10-14Volt direct current; in transmission it absorbs about 700mA, but consider that when it is connected to a WiFi device, due to the low duty cycle of the system the average current consumtion remains below 300mA, so you can use a common power supply device which provide 12Vdc 300mA. Which is the best TX power which must be set to the Access Point? Really? The amplifier works with 802.11g, setting the appropriate TX power. To transmit high bitrate (more than 11Mbps) in 22MHz of band, a complex modulation is used, which provide both phase and amplitude modulation. Amplitude modulation means that the transmitted power is not constant, but changes during the time to provide a better spectral efficiency, with the result of a poor power efficency (less coverage): if you've setup a low TX power, the RF detector inside the amplifier will switch from TX to RX even during transmission, when amplitude component of the modulation is low (small periods of 5-6uS); set TX power to an appropriate value (15-17dBm = 30-50mW). Which speed can be achieved at 11Mbps and 54Mbps, in a point-to-point link? =5.9Mbit/sec Linksys WRT54g on both sides as AP+WDS+WEP 128bit, TX power 15dBm (30mW). =7.2Mbit/sec Linksys WRT54g on both sides as AP+WDS+WEP 128bit, TX power 15dBm (30mW).WRT54g does not work, with the amplifier, at 48 and 54Mbps! Which bitrate should I use to increase the coverage? Which antenna should I use? It's convenient to use high gain antenna, because it's supposed that you need the amplifier to extend the WiFi coverage, so do NOT connect the amplifier to the small-gain antenna shipeed with the access point, but use high gain directional antennas (11-24dB gain, sectorial, log, yagi, dish) or omnidirectional collinear antennas (6-12dB gain). Which connectors should I use? To simplify cablings, the amplifier uses SMA connectors which are standard for microwave appliances, so it's easy to find the SMA male connector for the coaxial cable as like as SMA-N adapter if your coaxial cable is connectorized with N connector. * RP-SMA to SMA adapter, for the other devices. Amplifier does not work, for me... why? Is access point set-up correctly? When you've tried all this, if it works, try to increment TX rates and change TX power to achive the best performance. Which is the output power limit permitted by the law? The ISM 2.4GHz band can be used by any device which has less than 100mW ERP (20dBm ERP). ERP means "Effective Radiated Power", which can be calculated with the formula Ptx[dBm]-Acoax[dB]+Gant[dB]. For example: Transmitter power: 17dBm (50mW), Coax cable+connector loss: 4dB, Antenna gain: 11dB => Perp=17dBm-4dB+11dB=23dBm (200mW ERP) => the ERP power execedded the limit by 3dB: we need to change antenna or limit the power level down to 14dBm. Another example: Transmitter power: 30dBm (1W), cable loss: 4dB, antenna gain: 11dB => Perp=30dBm-4dB+11dB=37dBm ERP (5W ERP) => the effective radiated power exceed the limit by 17dB. These two example show how is difficult to meet ISM power limit with antennas with 10dB or more gain, but if you are a licensed amateur radio, you can install WiFi devices within the hamradio band with 40dBm ERP (10W ERP) power level, or more, depending by your country laws. How should I compute the gain of a dish antenna? where pi=3.14, Diametre is the diametre of the dish, lambda the wave length. gain=0.6*directivity=0.6*298=178 which correspond to about 22dB (or dBi, because it's referred to isotropic antenna model). Removing the RX gain reduce the coverage of the device, so it's not recommended. 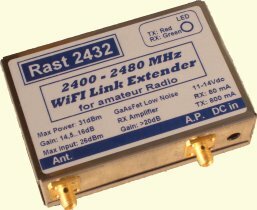 Also, because the amplifier contains a 2400-2480MHz band-pass filter (2360-2520 is the real coverage of the filter), it's a good idea to leave the first GaAsFet RX stage followed by the RX filter to reduce the off-band noise like UMTS/GSM repeaters and other services. 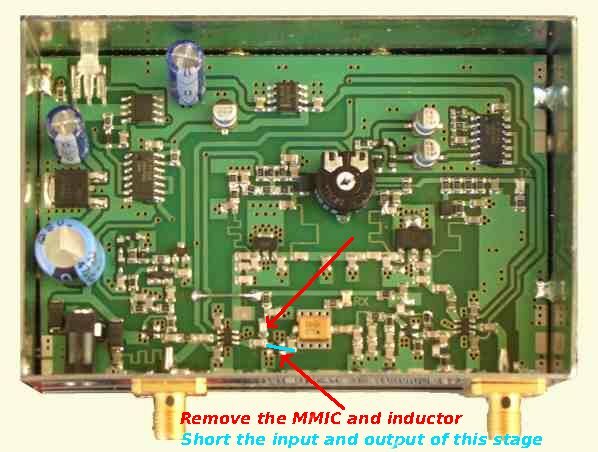 In the case the amplifier is installed in the top of a mountain where in-band noise is very high, you can remove the 2nd MMIC stage RX amplifier following the instructions on this photo: remove the MMCI at the left of the filter, then remove the inductor used to supply it, and connect with a small wire the two pads indicated. With this modification you'll get only 8dB of gain filtered by the band-pass filter. I have several other questions: how can I do? You can request any information and quotation sending an email to the address iw3grx@ir3ip.net, using skype (nickname iw3grx). This is a Direct Sequence Spread Spectrum transceiver with high sensitivity and output power which permit to measure the signal received by a similar device and to analyze the 2.4GHz ISM spectrum to determine the free WiFi channels. This is a hand-held device, internal supplied by 4 NiMH batteries, with charge circuitry inside; it is controlled by a microcontroller by a keyboard and an alphanumerical LCD display. With a single device, only the spectral analysis can be performed, to look at the 2.4GHz spectrum; using a couple of devices, it is possible to measure the RXed signal which is displayed and reproduced as a tone frequency: higher is the tone frequency, higher is the strength of the received signal. In this way is very easy to perform antenna alignment. You can request any info sending an email to the address iw3grx@ir3ip.net, using skype (nickname iw3grx). This simple circuit should be connected between the power supply and the access point to avoid troubles caused by software errors (blocking) or power supply interrupts (loss of configuration, access point bricking). It implements a minimum of protection (fuse) and filtering (inductor and varistor), also a microcontroller provide to enable/disable the power supply looking at the low voltage detector and time (power supply is disabled and then reenabled every period, set using one dip switch). The schematic, layout and PCB master are available to build the circuit by yourself.